Bio: Summer 2014, Bobnoxious releases their new album titled E.O.A. their 6th studio album. The controversial title track, E.O.A. attracted a lot of local media and political attention. With their ‘honest’ lyrical description of an area in their hometown city (London, Ontario) known as ‘East of Adelaide’ , the E.O.A. song received over 18,000 You Tube hits in less than 3 days. “The new album is our best work to date, it’s different than anything we have released before and is solid from start to finish”, says lead singer Bob Reid. Featuring Bob Reid on lead vocals and guitar, Dave Wyles on drums, Darcy Maudsley on bass and newest addition Chris Raposo on lead guitar (Rebel Few) the newest album E.O.A. is solid and diverse and sometimes a different side to what Bobnoxious fans have heard in past. With a cool flow to the record starting off with opening track “E.O.A.” which sets the rock tone while songs like “ All I Be ” are heavy and solid, “Funk It Up” which does just that, and “Sad Songs” with Juno award winner Ray Coburn on keyboards and string arrangements, displays a roller coaster ride of depth and musical integrity. 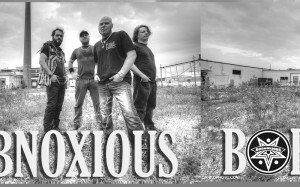 Over the past 10 years, Bobnoxious has rocked the stage with many different styles of bands like Kiss, Scorpions, Kid Rock, Tragically Hip, Cypress Hill, Danko Jones, Metric, Anvil, Sheep Dogs, Finger Eleven, Thornly, Grady, The Trews, Theory of a Deadman, Default, John Corabi, and friends Grim Skunk..